Anyway, we will have a bit of a crossover now. The last of the fourballs is still in progress and anyone's guess who will win it. 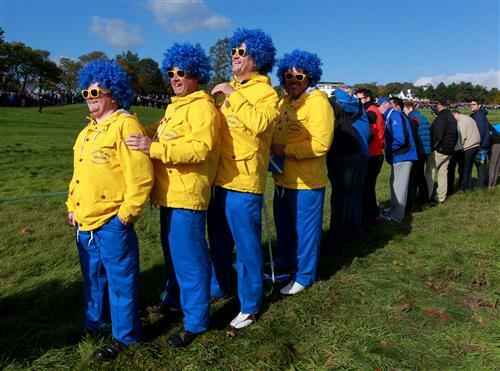 Meanwhile, Jim Furyk and Lee Westwood have just teed off in the foursomes. Of course, it is now alternate shots rather than everybody having their own ball. Mcllroy and Garcia have had a poor morning. Not looking good for the foursomes. Interesting thoughts, Al. They haven't been at their brilliant best and it's been a scrappy game but they could still seal a point against a very strong pairing. Still with their best to come, I would fancy them this afternoon. Not a bad first ever Ryder Cup shot for Jamie Donaldson, setting Westwood up nicely with a good approach shot. Meanwhile in the fourballs, Garcia just misses a chip in and it's all square heading into the 18th. now is Mcllroy's chance to show his class. Foursomes pairing number two about to get underway. In-form Justin Rose and Henrik Stenson take on Hunter Mahan and Zach Johnson. Who's your money on? Rose and Stenson are both playing well and will be too strong. Westwood can't follow up on Donaldson's fine approach, his birdie attempt just short. Shocking opener at the 18th from Bradley, sails well left leaving Mickelson to probably seal the deal. He finds the fairway. In response McIlroy also goes well out to the left while Garcia lands right next to Mickelson. Donaldson/Westwood v Furyk/Kuchar - Shared first hole in the foursomes. I thought Justin Rose might be a key player for Europe this year and he's certainly suggested that so far. Follows up his fine form this morning with a brilliant tee shot in the foursomes. I'm not convinced about pairing Garcia and Mcllroy. They are not feeding off each other. How big could that be? Mickelson falls just short and lands in the bunker by the green on the 18th. McIlroy and Garcia are set to tee off again in the foursomes in five minutes. Safe to say that will not be happening. Their afternoon match will be a bit delayed as they need at least half an hour in the team room. Bradley back in business after that poor first shot and he chips nicely onto the green. All three other men are in the bunker. A couple of good shots out the bunker from the European boys but it's advantage USA now. Rory misses his chance and it's down to Bradley now to win it. Rory has played like a muppett. Can you believe it!? Bradley's mixed hole ends in disappointment and it's in the balance once again. Garcia makes par, but it's Mickelson's three foot putt for the win. How many birdies to Garcia and Mcllroy make? Very ordinary. A morning of two halves for Europe I'd say. Looked great through the first nine but they trail by a point at the end of that session. Shame, was hoping McIlroy & Garcia would at least half it, lets see what this afternoon brings. Jay hardly No1 and No3 in the world form though. Any idea who these guys are supporting...? Rose & Stenson v Mahan & Johnson. The European pair continuing their form as Rose lands a long one to take the lead. Donaldson & McDowell v Furyk & Kuchar. Jamie Donaldson misses his five foot putt and USA take the lead in match one. Donaldson so close to putting Europe 2 up but the ball won't drop. After a shaky start, the Welshman is looking good. Zach Johnson holes the putt, after an interesting system of Mahan straddling the ball first, to reduce the lead to one. McDowell & Dubuisson v Bradley & Mickelson - Bradley misses allowing Dubuisson and McDowell to move 1 up. They lead in every match. McIlroy & Garcia got this one on thought, both held out Fowler in this years open they have the beating of him and Walker, Walker's game nowhere near the europeans either. Nope Walker only made one putt this morning, although that was to seal half a point on the 18th. Can't ask for much more than that from your partner! A superb approach shot from rookie Dubuisson sets Westwood up beautifully. Different scenario i know, however when its head to head mentally we europeans have the edge.